Moonroof, Heated Leather Seats, Remote Engine Start, Onboard Communications System, Cross-Traffic Alert, Dual Zone A/C, TRANSMISSION, 9-SPEED AUTOMATIC, ELEC... NIGHTFALL GRAY METALLIC exterior and JET BLACK interior, Blazer trim AND MORE!======KEY FEATURES INCLUDE: Leather Seats, All Wheel Drive, Power Liftgate, Heated Driver Seat, Back-Up Camera, Satellite Radio, Onboard Communications System, Remote Engine Start, Dual Zone A/C, Cross-Traffic Alert, Blind Spot Monitor, WiFi Hotspot, Heated Seats, Heated Leather Seats Privacy Glass, Keyless Entry, Remote Trunk Release, Child Safety Locks, Alarm. ======OPTION PACKAGES: SUN AND WHEELS PACKAGE (Includes (C3U) Panoramic power sunroof, (SP3) 20" Bright Silver aluminum wheels and (QNU) 20" all-season blackwall tires. (SP3) 20" Bright Silver aluminum wheels is upgradeable for an additional charge to (S2D) 20" Gloss Black aluminum wheels, LPO. ), AUDIO SYSTEM, CHEVROLET INFOTAINMENT 3 SYSTEM 8" diagonal color touchscreen, AM/FM stereo. Additional features for compatible phones include: Bluetooth audio streaming for 2 active devices, voice command pass-through to phone, Apple CarPlay and Android Auto capable. (STD), TRANSMISSION, 9-SPEED AUTOMATIC, ELECTRONICALLY-CONTROLLED with overdrive, includes Driver Shift Control (STD), ENGINE, 3.6L V6, SIDI, DOHC WITH VARIABLE VALVE TIMING (VVT) and Active Fuel Management with Stop/Start (305 hp [227 kW] @ 6600 rpm, 269 lb-ft of torque [365 N-m] @ 5000 rpm) (STD). Chevrolet Blazer with NIGHTFALL GRAY METALLIC exterior and JET BLACK interior features a V6 Cylinder Engine with 305 HP at 6600 RPM*. ======BUY FROM AN AWARD WINNING DEALER: North Star is the #1 Volume Dealer in Pittsburgh! 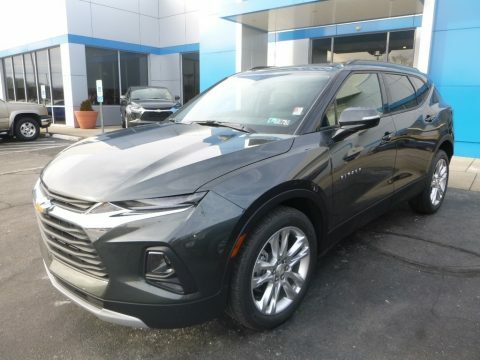 As a GM "Mark of Excellence Award" winner for Outstanding Sales, Customer Satisfaction and Service in Pittsburgh for over ten years, our pricing strategy is simple Horsepower calculations based on trim engine configuration. Please confirm the accuracy of the included equipment by calling us prior to purchase.